Residential electricians commonly use white insulated conductors inside of NM cable as ungrounded conductors. This month’s “Right or Wrong” covers the details on how to properly use white or gray conductors as “hots”. Section 200.7 of the 2014 National Electrical Code covers the use of white insulated conductors. 200.7(A) specifies that a white or gray conductor or a conductor with three with or gray stripes on other than green insulation shall only be used as a grounded conductor unless specifically permitted by 200.7(B) or 200.7(C). Section 200.7(B) applies to circuits of less than 50 volts that are required to be grounded in Article 250. This article will concentrate on the more common application that applies to circuits over 50 volts. Electricians commonly use NM cable, or “Romex”, for wiring residential occupancies. Typically a 10/2 with ground NM cable is used to feed a water heater on a 240-volt circuit and the white insulated conductor is used for one of the “hot” legs. Is this a code compliant installation? It is if the white conductor is properly identified at each termination point. 200.7(C) states that a white or gray insulated conductor may be used as an ungrounded conductor; If part of a cable assembly that has the insulation permanently reidentified to indicate its use as an ungrounded conductor by marking tape, painting, or other effective means at its termination and at each location where the conductor is visible and accessible. Identification shall encircle the insulation and shall be a color other than white, gray, or green. If used for single-pole, 3-way, or 4-way switch loops, the reidentified conductor with white or gray insulation or three continuous white stripes shall be used only for the supply to the switch, but not as the return conductor from the switch to the outlet. In the attached photo, you can see a humorous application of this code requirement. The installer certainly identified the ungrounded conductors but did not quite meet the requirements of the National Electrical Code. The N.E.C. requires the identification to “encircle” the conductor. This is usually accomplished by the use of electrical tape or a black marker. When using white or gray conductors as ungrounded conductors remember a few rules. The conductors must be reidentified at each termination point and each point where the conductor is accessible and visible, such as junction and outlet boxes. The marking can be made with tape, paint, or other effective means but must encircle the conductor. The white or gray conductor must be in a cable assembly. It is never legal to use an individual white or gray conductor as an ungrounded conductor even if it is reidentified. Lastly, if the reidentified conductor is used in a switch loop, it cannot be used to supply power to the outlet. To meet this code rule, you must use the white or gray conductor to feed power to the switch and then use the black or red conductor in the NM cable to feed the outlet. Proper identification of conductors is vital to a safe electrical system. Be sure to check back here often for updated blogs and illustrations to help keep you at the top of the electrical field. classes4contractors.com has electrical training courses, electrical exam preparation classes, free electrical practice tests, live seminars, private classes, and electrical practice questions to help you learn more about the National Electrical Code or prepare you for your upcoming electrical exam. We also offer on-line continuing education courses for Texas electricians as well as live CE classes for Ohio, Alabama, North Carolina, and other states. Our instructors have decades of experience and are licensed electrical contractors and master electricians. Ask us about live instruction and private classes. Spend some time browsing our site and please email any suggestions or questions to classes4contractors@gmail.com. Send us a picture of a code violation or a proper installation and if we use it in an article, we will send you a great prize. Always identify all conductors,and also double and triple check each other’s work. Keep yourself and others working with or around you. Stay up to the latest and best information, so that your installation is done professionally. First of all if it’s a black wire in the breaker, it does not need a marking. 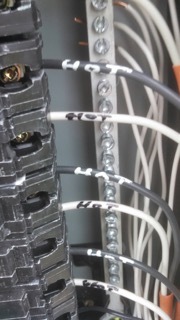 And the markings on a neutral wire should be done with black tape over the it, or a writing of “hot” on a tape wrapped around the neutral wire. Or if the white wires are meant to be neutrals, then they do not go there. Always use thge correct director the job.